Qmee App Review: Can You Make Money With Qmee? Qmee App Review: Can You Really Make Money With The Qmee App? I’ve written about Qmee before, but when I originally wrote my review – there was no App available. I wanted to write this review separately because, unlike the Qmee browser extension, the App won’t alert you to deals in order to make money. 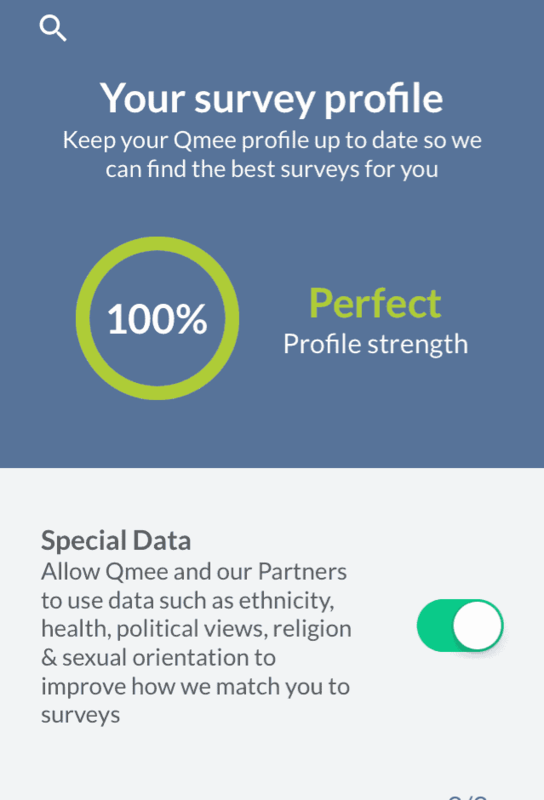 The Qmee App largely consists of surveys, but also has offers on it as well. But… Can you really make money with Qmee?! Well yes…. But whether you think it’s worth your time will depend. I will explain more as we go on. What Is The Qmee App – How Do You Get Started? The Qmee App and the Qmee browser extension/website offer different ways to make money online and I recommend you get a regular Qmee account on your PC or laptop first. You can then download their browser extension. This extension will alert you while you browse the web with alternative suggestions for things you’re looking for – and pay you for clicking on their suggestion. For example; say you’re browsing the web for a certain type of dress. Qmee may then appear to the side of the screen with alternative suggestions to the Google search, or even your search on Amazon. There will be a price next to the alternative suggestion, which lets you know how much you’ll be paid if you click on the Qmee suggestion. You don’t have to buy anything, simply clicking on the link will get you the cash. You’re talking about pennies/cents here though, you don’t get much for it – but it’s still free cash! Often I see around 6p or so for clicking on their suggestion. Sign up to Qmee here and download their browser extension. You can also complete surveys on the main website. The App, by contrast, just focuses on surveys and deals/coupons. Once you have your account set up and email verified – download the Qmee app via Apple or Google Play. Simply search for “Qmee,” and you should find it. As you’re already a Qmee member, you can simply now login to the App. Any money you have already made, you will now see on the App as well, so your accounts will be fully connected – whether you’re on your mobile or PC. Once you have logged in, you will need to complete your profile prior to getting surveys. This will consist of answering lots of questions in a variety of areas, (your occupation/income/family and so on) and will help Qmee to match you for surveys that you will actually qualify for. When I first joined Qmee and started doing surveys, I don’t recall ever completing a profile section… which would possibly explain why I didn’t qualify for many surveys. SO, this time I completed my profile up to 100%. It took me a while to complete all the questions – around 15-20 minutes. However, the App was really quick and smooth to use – it felt so much quicker to answer these questions on my phone, (as opposed to my laptop, which is what I usually do). If you want to check out the App, you will see that it will simply consist of surveys you can do, a referral program, (where you can earn £1 for every friend or family member that signs up – on their first PayPal cash-out) and an offer section, where Qmee suggests discounts and offers that you may be interested in. What tabs you have available on the Qmee App, will also depend on your location. I’m in the UK and only have the Surveys and offers available. If you’re in the US, you will likely see a coupon section also. Browsing through the offers, I didn’t see anything that exciting – but these offers will change and what offers you actually see, are going to be dependent on where you’re located. How much you earn per survey seems to vary significantly. As you can see above, there is one for 15p that takes 8 minutes – but one for £1.20 that only takes 12 minutes. I took a survey that said it would only take 5 minutes for 39p. I was surprised that I actually managed to complete the whole survey and qualified. Although, it had taken a little longer than I expected. How Much Can You Earn At Qmee App? How much you get paid per survey is going to vary – taking a look at my app at this current time, there are now 6 surveys available to me – and no guarantee whether I would qualify for them all. If I managed to complete/qualify for all these, (which is unlikely) and they took the exact amount of time that they claim – I would £1.87 make in just under one hour, (more realistically, it would be over one hour). Less than £2 for an hours work!! Way under minimum wage and a lot of effort, for not very much. I think this App is really well designed and if you can get the odd higher paying survey, (which do pop up — ones over a pound are going to be more worth it and aren’t always longer) then there is no harm in earning a few extra pounds. But, as you can see – many surveys don’t pay much, so it may be worth holding out for the ones worth a little more. How Can You Cash Out? You can cash-out via PayPal, (which would be my preferred option) or now you can also cash out with gift cards. Again, what gift cards are available, will depend on your location. At the moment, (in the UK) I can get gift cards with Amazon, App store and Starbucks. You only need £5 to cash out. Since I’m doing this review, I thought I’d cash-out some of what I have in the bank on a Starbucks gift card for a change and get a super fancy coffee next time I’m in town. Be careful to copy it, or write it down correctly. I wrote mine down incorrectly and had to contact site support for help! When you contact Qmee support, you may have to wait up to 24 hours for them to reply. What Do Other People Say About The Qmee App? Qmee in general has good feedback online – however, the App itself also has good feedback online. Qmee surveys has a 4.5 star rating on the App Store and over 600 ratings at the time of writing. This is a really good rating for an App like this – particularly anything related to online surveys, (which tend to get badly reviewed frequently). As one of the reviewers said – you can quite easily earn £1 a day with this app and if you save that up… it’s £365 a year. Imagine you started in December one year and took the cash out the following December, just in time to buy your gifts. Not bad really if you enjoy it and aren’t wasting tonnes of time. For example; it could be a way to pass the time on the commute to work – or maybe when you’re half watching TV… or wake up in the night and can’t get to sleep! Or maybe you’re a coffee addict and you can save up for Starbucks gift cards and have a super expensive blow-out coffee, (like me!!…). Qmee also has a great rating on Google Play. Again, over 4 stars and over 3,000 reviews this time. Great looking App, easy to navigate. Quick to sign up and get started. Complete your profile & you can qualify for surveys better than many sites. Great for doing paid surveys away from home. Can cash out via PayPal/gift cards. Ways to earn via the APP and with the browser extension via laptop/PC. You can withdraw your earnings from only £5/$5 for a gift card – and there is NO minimum cash out for PayPal! Which is excellent. Not a large earning opportunity. Could be more offers available, (but this is dependent on location and can change over time. >> Sign up to QMEE here. A nice element to this is that you can sign up to Qmee and have their browser extension to earn from surfing the web, but also have your account linked to the APP. So, you can earn from surveys whether via a PC/laptop, or on your phone and your earnings will all add up in one place. Can You Make Money With Qmee? Is The Qmee App Legit? Well, yes… and yes! However, this is still a small income opportunity. You can completely make a pound a day, (or a dollar!) and save up to something more substantial, rather than cashing out as soon as you have any in the bank. Even though the surveys pay low, this is still one of my favourite online survey opportunities that I have found. You can qualify for more surveys with Qmee. Many tend to be fairly quick. Many between 5-15 minutes. There is NO minimum withdrawal amount for PayPal. The App is really slick to use and you can use it while your out – rather than being a slave to your laptop. As such, if you’re interested in making a small amount of extra cash and enjoy online surveys – you should check out Qmee and let me know how you get on! You may also want to check out…. Beyond Paid Surveys Online – Making More For Your Time? Paid surveys are a small, (but highly popular) extra earning opportunity. However, they’re not very good if you’re looking to make more substantial money over time. That’s why I started my own website. It’s a way that I can grow something over time that can become a valuable asset and grows over time. When I started this site a little under three years ago, I had zero visitors – but now I have tens of thousands of visitors each month and growing all the time. The more visitors you have to a website, the more potential you have to make money – whether you’re selling your own products, have advertising on your site, sponsored posts, or affiliate marketing. Basically, if you have visitors, (traffic) you can make money. But how do you start a website, how do you get traffic and how do you make money? Good question! Well, it’s easy to start a website. It’s not so easy to start getting thousands and thousands of visitors – that bit takes time. But it is worth the effort. If you’d like to learn how I make money from running a website, this is where I got started. Let me know your favourite way to make or save online!